When I started blogging I had little idea about blogging, let alone photography. As time passed, I realized how important it is for a photo to look appealing. Photos make connection with readers first, then comes the writing and recipe part. In my free time, I go through numerous blogs to understand the art of photography. Few of my favourite bloggers are Kankana Saxena, Tanvi, Sneh, Kulsum, Sukaina, Hina, Erin...I go through their blogs everyday! You must check out their work...it is exceptional! Inspired, I painted my wooden backdrop blue for this post and my my, does it look awesome or what! Those bright red strawberries on blue board!! We made a weekend trip to Panchgani in the month of July, by that time monsoon had started. Panchgani is a hill station in the state of Maharashtra and is one of the major cultivation sites of strawberries in India. Strawberry being a delicate fruit doesn't thrive well during rains. I was lucky I managed to relish some. I have been desperately waiting for them to appear in the market since then. Juicy red jewels are finally here! Delicious strawberries make for a healthy snack at any time of the day. They are incredible in salads, milkshakes, smoothies, cakes and over ice-creams, pancakes, waffles. Strawberries are best eaten fresh but they are good frozen too. Freeze them when the produce is best (That goes with any produce you want to freeze). This year I am going to freeze some batches to whip up smoothies later. 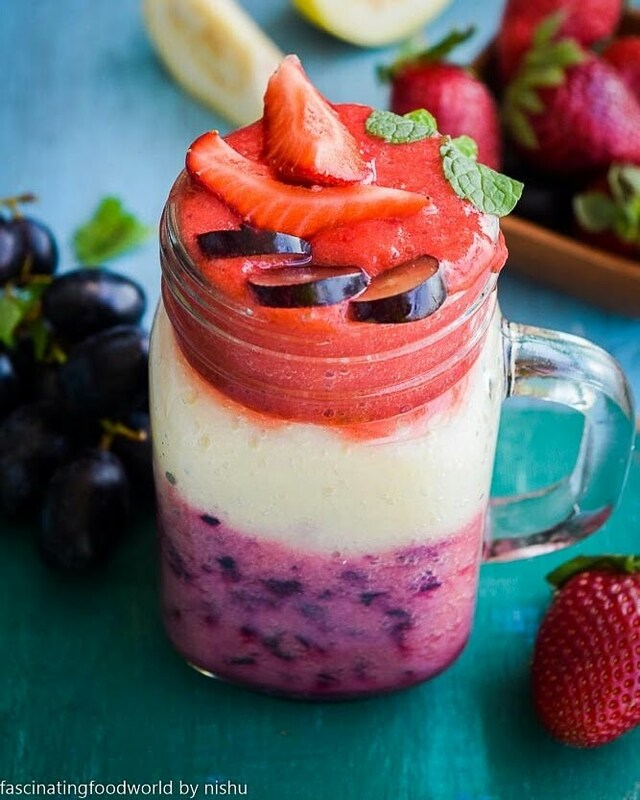 Smoothie is a blended beverage made with fruits. Add ons can be nutella, peanut butter, ice-cream (non-healthy version) and yoghurt, milk, soy milk (healthy versions). Its my all-time favorite breakfast especially when I am running late for work. Referred to as a health drink, it fixes your nutrition quota for the day. This smoothie highlights the delicious flavour of fresh seasonal strawberries with hint of cinnamon which tastes wonderful. Make it before leaving the house and sip it on your way to office/school/college. 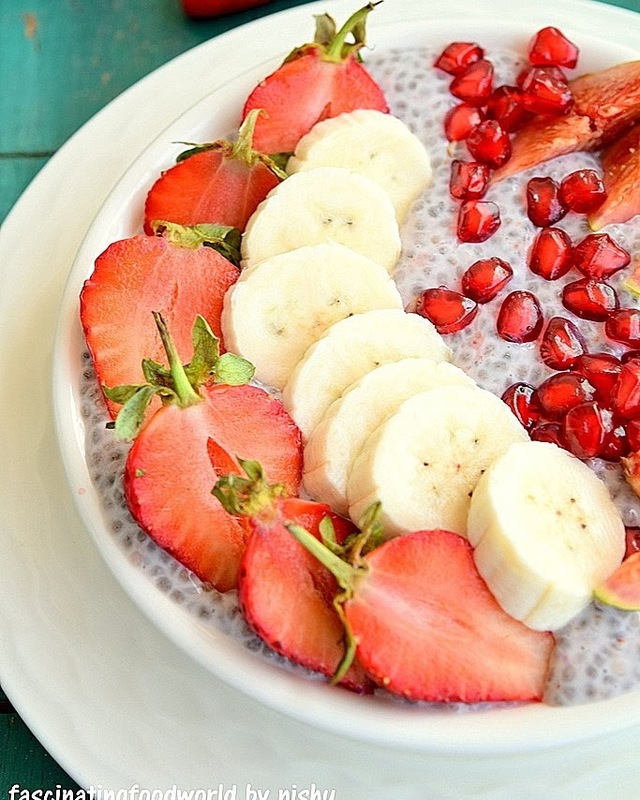 Add strawberries, yogurt, orange juice, oats, honey and cinnamon in a blender. Top with flax and sunflower seeds(optional).